The is a well designed machine that offers some great features for the advanced sewer and is also simple enough for the beginner quilter to use with ease. As with all other sewing machines in the Singer Confidence line, the nicest feature of this model is that it offers a lot of automation for fast and easy sewing as well as the ability to adjust settings as your skills progress. 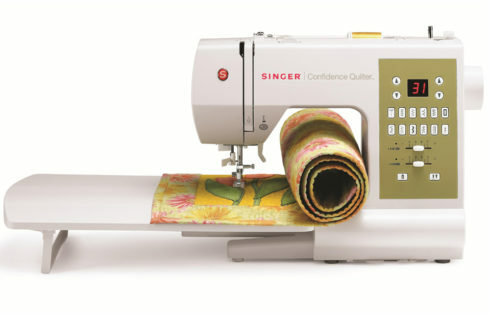 The Singer 7469Q Confidence comes with 100 built-in stitches, with the stitch width and length both adjustable up to 7 mm depending on the stitch that is selected. The 100 stitches include all utility stitches, 7 different styles of 1-step buttonhole stitches, and a fabulous selection of decorative stitches. 13 possible needle positions let you get as close to the seam as you need to for topstitching, zipper insertion or to finish off any complicated or decorative stitch. Twin needles allow you to run 2 lines of identical stitches in the same or different colors. A twin needle control button makes it easier to switch between stitches that are twin-needle compatible and those that aren’t. Electronically controlled stepper motors help you get perfectly formed stitch patterns every time. Stitch selection is made easy with two up/down arrow keys located on either side of the LED screen and the conveniently located pull-out reference guide. 12 one-step, push and sew buttons for most-used utility and ornamental stitches. Solid and sturdy, the Singer 7469Q has a heavy duty metal frame and can easily handle a range of fabrics from sheer to multiple layers of fleece as long as you use the right needle and thread combinations. Automatic Needle Threader and Automatic Bobbin Winding Clutch: Automation makes both of these operations quick and easy. No more getting frustrated even before you sit down to sew. Drop and Sew Bobbin System: The top-loading bobbin system makes easy work of preparing the machine for sewing. Just drop the bobbin in, loop the guide and you are ready to sew. Automatic Presser Foot Pressure: No more having to fiddle around making pressure adjustments to suit the fabric you are working with. The machine automatically adjusts the pressure for you. Optimum Power Control: The pressure foot pressure is supported by the optimum power control feature that senses when extra power is needed for sewing over multiple layers of fabric so that the stitching and speed remain even. Programmable Needle Up/Down Feature: Offers invaluable help for quilters when piecing together patchwork. Drop Feed: Allows for more creative top stitching and is very useful when adding creative touches such as monograms to quilts. Three Bonus Quilting Feet: The Darning & Embroidery foot, even feed foot and ¼” foot enhances creative sewing and quilting potential. Extension Table: Increases the sewing surface and makes it easier to manage large size sewing projects and large quilts. The extension table can be easily assembled and unassembled in just a few steps. Extra High Presser Foot Lifter: Offers that extra clearance that is necessary with quilting and sewing bulky fabrics. The Singer 7469 Q Confidence offers tremendous value for money if you are looking for a machine with lots of functionalities to cover beginning quilting as well as dressmaking and craft sewing.